When we speak about timeless classic in EM, we have to slide this album at the top of the list. I was lucky to put my hand on it when it was released back in 1985. EM knew then a major bend. Its craftsmen tried to influence the kind towards a more accessible approach, abandoning the long pieces of music for more melodious structures with the use of the digital synths and\or a wide range of samplings. This period of transition left us all the same in inheritance some very good albums. 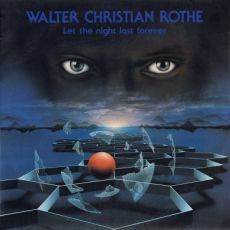 “Let The Night Last Forever” from Walter Christian Rothe is one of them. Some people will say, and I am one of them, that this 2nd album of the Belgian musician is the precursor of this dark and poetic EM where reign a sordid atmosphere of horror. There were well some albums of Mark Shreeve, but none had this very theatrical touch, and nevertheless very melodic, but “Let The Night Last Forever”. This album of which the time has never succeed to buried in the oblivion (I transferred the album onto a mini--disc and then the mini--disc on CD-r) sees finally the day, thanks to the Groove NL label, in a beautiful reedition which includes 2 titles in bonus and a lot of infos. Angels' horns announcing the end of time knock out our senses at the opening of "Intro + Dawnfall". On a fascinating aria of funeral procession, the solemn walking of “Let The Night Last Forever” overture hammers as much our curiosity as our interrogation. What kind of music is it? Lugubrious and nevertheless melodic, this introduction hears out these horns get out of breath while percussions, sequences and a pulsating line of bass establish a slow rhythm but a surprising lively one. We put back our senses in place that this luxurious melody, which will haunt you from the first listening, plunges the listener into a charming musical universe with an assortment of sound effects and unusual noises which add a dimension of bewilderment and of surprise and to "Intro + Dawnfall" and to all this 2nd album of Walter Christian Rothe. "The Next Leaf" follows with a delicate lullaby, I would even say a bed song settled on the harmonies of a small carousel where shiver musical chords in the coldness of the void. These keyboard chords roam with their tones as dark as polyhedral, like a fight of stars where the winner remains the emptiness. The influences of Vangelis turn up here with effects of voices and whispers which redirect "The Next Leaf" towards the nocturnal cradle of “Let The Night Last Forever”. The sumptuous dance of tea is another small jewel which coils up so easily to the bottom of our eardrums. Imagine an old baroque dance where the dancers make some low bows face-to-face on Latin harmonies, and you have the very beautiful atmospheres of "Tea-Dance". A pure delight! "Sahara" carries its title marvellously. It’s an arid music full of sound mirages with a synth, once again soaked with a Latin perfume, which spreads its melody like we throw a veil in the wind. We can’t get out of it! The charms of this album are just eating us piece by piece. We stay in the field of music for ambiences with the fine jerks of "Death". Synth layers are caressing this spasmodic orchestral procession whereas sound effects and metallic percussions tickle a fascinating melody whistled by a synth in mode charm. It’s very good. Too good! And it’s the drama of “Let The Night Last Forever”. We got up in order to turn the vinyl for Face B, that we changed idea and we replay instead Face A. Nevertheless, the Face B is not that bad and re edited in a CD format here, we have now the opportunity to listen to it and to reveal thus the behinds the scene of Face A, because everything turns around that. With its rhythm of electronic rock arisen from the MIDI sound, "Radio" reveals another likely facet of Dawnfall, but in a more pop envelope of the New wave years. "Verena"? One would say a roommate of "The Next Leaf" in less melodious and much darker. If we perceive some influences of Vangelis, they are clearly more omnipresent on "Hymn", a title of intense ambiences with beautiful lento movements of orchestrations. There is a little of "Death" here as also a lot of perfumes of Blade Runner. The title-track loops the loop of an intense album with a kind of sound mosaic which drinks mainly from the first 45 minutes of “Let The Night Last Forever”. The rhythm is soft. Filled of percussive effects, it walks slowly with a dense sonic coat of very lugubrious orchestrations and ends with these clarions of angels which had made us shiver at the opening. Like if Walter Christian Rothe wanted to give us a simple reminder of a grand work which gave to EM a new sphere to explore. This new version comes with 2 bonus tracks among which "Music for KLEM" recorded at the same time. The tone is very old with gargantuan organs, the source comes from the 1986 KLEM Jubilee MC, but the very theatrical ambiences of the album; the slow rhythm, the explosions and the effects, are well represented here. "El Tiempo" is a small rather symphonic sweetness with a clearly more advantageous tone. It’s a kind of ode for Elfs, which appeared on the KLEM Jubilee CD of 1989, with moments that make you raise the hairs of the back. Orchestrations, as much the softs as the explosives, are in the heart of a music which drew its roots from the very magnificent “Let The Night Last Forever”. An inescapable in this astonishing universe of EM!